"The earliest boat race between these two Colonies was rowed in 1863 in gigs over a three-mile course on the Parramatta River, N.S.W. The N.S.W. four won (time, 19 min. 25 sec.). "In this race the crews were of a representative character, and each crew bore the name of its colony. 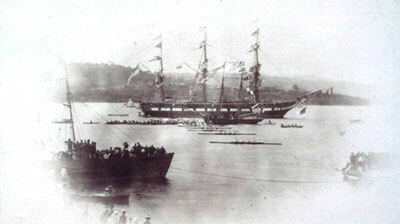 The Victorian crew was made up of members from the Elswick, Melbourne, and Melbourne University Clubs. "After the race the differences about the amateur status of oarsmen in the two Colonies became accentuated, Victoria alleging the New South Wales crew were to all intents and purposes watermen, having rowed against watermen and for money prizes. The Victorian definition excluded both sorts of oarsmen from amateur competition." This definition of amateur was to cause disputes in intercolonial competition for many years. Even after a definition was agreed in 1896, the dispute continued with further attempts to rewrite the definition through to WWI. None of these attempts were successful in gaining the agreement of all States and so the 1896 definition remained. "For some years this break [Ed: the break caused by the diasagreement over an amateur definition] continued, preventing competition by crews really representing the Colonies, though club crews frequently raced in Intercolonial matches, the crews being club crews charged more or less with a mission to win the honours for their Colony. In 1870 a race took place at the Balmain Regatta, N.S.W., which the New South Wales crew won against Tasmanian crews, Victoria not being represented." The race attracted a prize of 100 sovereigns or trophies to that value at the option of the winner. "In 1872 a race was rowed over a five-mile course on the Derwent River, Tasmania, the Sydney Rowing Club winning against the Parramatta Rowing Club, some Hobart Club crews, and one from the Barwon Rowing Club, the time for the course being 36 min. 30 sec. "The same year over a 7,000 yard course on Sydney Harbour two crews from the Sydney Rowing Club beat a Victorian crew (of an Intercolonial character, the crew being composed of members of various clubs, among whom were members of the Civil Service, University, and Melbourne Rowing Clubs)." The race was won by 1/4 mile by Sydney before the Governor and some 20,000 spectators. The Governor presented the winners with 100 sovereigns in a white stain purse embroidered by a Tasmanian lady. The Parramatta crew contained our first Prime Minister, Edmund Barton. There was sympathy for the Hobart and Barwon crews who rowed in boats some 50 lb heavier than the Sydney boats. "It had been calumniously said that Tasmanians did not know how to cheer. But to show that it was a foul calumny, he called upon them to give three cheers at the top of their voices on that occasion for the Sydney Rowing Club. (Three most enthusiastic cheers were then given, with 'one cheer more' several times repeated.) His Excellency then gave the winning crew the purse containing the prize in a glazed case, the purse being tastefully made, and ornamented with flags embroided by the fair hands of a lady as the Governor had stated. He also gave a prize of £20 to the coxswain of the Parramatta crew." One of the Barwon crew, James Strachan from Geelong, had raced for Cambridge in 1870 winning the Boat Race against Oxford.